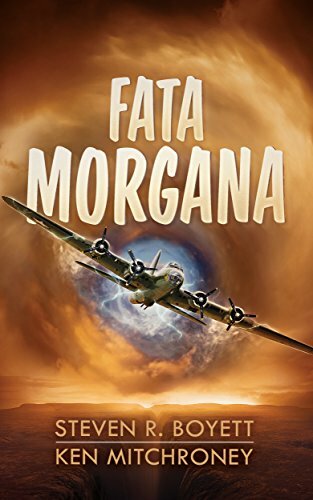 After dropping their bombs on a German factory in the midst of WWII, the crew of a flak-damaged, bullet-ridden American B-17 bomber named Fata Morgana finds themselves buffeting wildly inside of a mysterious hurricane of dark clouds and vicious multidirectional winds. All of the electronics and gauges aboard the plane misbehave. The massive bomber is forced down into a dark landscape that resembles nothing on Earth. Thanks to his excellent skill as a pilot, Captain Farley is able to land the plane in a desolate place. They are met on the ground by a group of people in strange clothing who take them to their living quarters inside of a huge domed city. It does not take long for the crew to notice that these strange people have very advanced electronics and sophisticated computers, capabilities well beyond 1943 Earth. The Americans befriend these humans with a history no one knows and an enemy near their doorstep. Lacking sunlight, they must apply artificial light for their crops to survive. Painted along the front side of the Fata Morgana crew cabin is a beautiful, dark haired woman with a furtive aura. Unlike other Allied bombers with drawings of famous Hollywood dames, this beautiful and mysterious woman resembles no one recognizable. The crewmember who drew the woman is unable to explain who she is or why she is on the side of an American bomber. That is, until Joe Farley and his crew greet the woman in this desolate landscape who does not just resemble the drawn caricature on the B-17—she is the very same person. There can be no doubt. But how could an American air crewmember paint someone who is the spitting image of a woman living in this strange, unknown world? She quickly begins to tug at Captain Farley’s heart. Marooned in a dark, devastated world in a dystopian future, Farley’s bomber and his crew become hostages between the remnants of two ancient warring cultures. Sandwiched between these ancient bitter enemies lies a terrifying weapon threatening Farley, his crew, and the people they encounter inside the domed city. Half plane with advanced weapons and half awe-inspiring creature, it is programmed to defend the enemy of their new friends. They call it, “the Typhon.” Sight of this horrific beast in the air was enough to make anyone run for their lives. Apparently, no weapon can destroy it. Just below the surface of everyone’s daily routine is the constant fear of attack by the other human colony and their Typhon. Little is known about them and their cavernous home inside of a massive crater. Deep below ground are mechanical self-replicating creatures that resemble giant bugs. They are programmed to repair anything and everything belonging to that society, especially the Typhon. Farley’s crew must use all of their daunting ingenuity and courage to survive. The B-17 crew mesmerizes the dome people, teaching them about baseball, mid-20th century slang, and Hollywood, and aiding them with whatever work needs to be accomplished. These people use advanced materials and laser weapons. They also have computer-aided machines that appear miraculous to the Americans. The brave crew of the Fata Morgana have landed in a future time as well as a place that no one can recognize. Captain Farley falls in love with the dark haired woman whose image adorns the cockpit of his B-17. It seems impossible. But she is the very same person. Her name is Wennda. Her father is the leader of the people living under the dome. Torn between family, community, and her nascent love for Joe Farley, Wennda decides to help the B-17 crew return to their time and place, back on the Earth that they left after bombing a German war factory, but with a twist. Authors Boyett and Mitchroney deliver a well-grounded, gripping action thriller, with a fast-moving plot and inviting, evocative characters. It’s not difficult for the reader to imagine what might happen to a bomber crew slipping into a strange dimension like the Bermuda Triangle and then having to fight with all of their resourcefulness to survive and return home. The authors deliver equal parts suspense, romance, danger, aerial combat, and science fiction. All of this makes Fata Morgana an exhilarating, haunting, and memorable read.